Discover a lush and mountainous Morocco on this exciting 10 day tour. Beginning in Fez, a city still reminiscent of the Middle Ages, you explore French villages, Moroccan lakes, stark mountain ranges, rocky plains, fresh water springs and waterfalls, and volcanic stone that sprouts grass. Along the way you encounter animals such as sheep, goats, camels, monkeys, and a multitude of birds. Explore the land of the Nomads and make note of their legendary lifestyle as we pass by Berber villages of clay huts established miles from anywhere. This amazing trip takes you toward the Lake Afnourir Nature Reservation, where you spend one last peaceful night in the wilderness. - Swimming with the horses! 2019 Pick-up from airport or hotel in Fes included. Individual return. Pick-up is available from Fès-Saïs Airport (FEZ) after 9:00am on the first day of the trip. Check-out on the last day is at 12:00pm. Arrival in Fes. Transfer to Riad (traditional Moroccan house or palace). Dinner in the medina of Fes and night in the riad. In the morning you will visit the medina of Fes. This old medina is very spectacular. Built in 808 by Moulay Idris de II, you will feel like you're in the middle ages. You will see the old University, the Souk with its small shops, the magnificent mausoleum of the founder of Fes Moulay Idris II, the huge mosque of Karaouin, the tanneries, and so much more that you won't want to blink! An hour drive by car will bring you up to the Atlas Mountain, where you will have picnic beside a lake. Moroccans often comes here to enjoy the nature. Afterwards we will pas to Ifran. The town of Ifran was built in 1929 by the French. This little town, with its pointy rooftops and flowery alleys is at a height of 1700 meters (approx. 5500 feet) above the sea. Ifran is very popular for his agreeable climate in the summer. The horses stand outside Ifran beside a lake – but there is only water if it had enough raining or snowing in winter. On a short ride you will to know you new friend, your horse. We'll spend the night in tents. The day will start at the plain of the lakes. In dry years the lakes get very small or even are disappearing. On the big plane we'll find immense fields of lavender. The famers have bees and the region is very famous for the lavender honey. Big cedar trees grow beside the hills. In the forest are living many kinds of birds, the famous berber monkey of the Atlas and a few wild boars, which you may see occasionally. In the afternoon, we will leave the woods and ride over big lonely planes. The day will end in a fertile valley. The camp is beside a big spring, where you have possibility to wash in the clean and cold river. We will reach the Tchachoukt mountains and climb up on little mule way up to 2000 meters (approx. 6500 feet). You will see a beautiful view over the big valley of Gigou. Over a plane we will reach the river Ain Nokra, where the horses can drink then we follow a lonely canyon. We will travel through many small valleys, between big cedar woods where the grass may grow a meter high. In the evening, we will reach Jebel Agbalou and it is here that we may see exceptionally big cedars that have a diameter of more than one meter. Only a few lucky trees have the chance to grow so old as sheep and goats eat most young trees. We will descend via narrow mountain paths and have a splendid overview of the clear blue sky and the big lake called Aguelmane Sidi Ali. We will sleep in tents. In the morning, we will ride to the heart of the great grassy plains where we will have many opportunities for many gallops. This is the empire of the Nomads as there is not a single village in the vicinity. We will meet occasional lonely tents on our way as well as huge herds of sheep and goat and perhaps even a herd of camels. In the afternoon, the horses will take a break and we will have the chance to refresh ourselves at the feet of the mountain. Again we will make camp at the lake Aguelmane Sidi Ali, with possibility to swim with our horses. Don't miss this splendid opportunity! We will sleep in tents again. Today we will leave the area of the lake. A nice and quiet valley will take you to the volcanic plane of Bekrite. Rocks of petrified lava are everywhere and are the soil for many herbs. Our way is slowly getting higher and higher up to 2000 meters (approx. 6500 feet). The green grass growing between the black vulcanic stone is very impressive. We will see many old craters and it is here that the nomads are still living in their clay houses, with their herds in the close vicinity. We will camp at the side of a river. Today is again more agriculture, bigger villages. but between each valley there are wild mountains, gorges, cederwoods or stoney planes. This is the longest riding day of the week. You will see some land which are carved by heavy erosion. Red, yellow and brown mountain ranges can be seen at the horizon, beyond salt lakes. Then we will climb down to the springs of the river Oum-Erbia. 40 little springs are coming here together in big wild river. This place is very famous for Moroccan tourists. There are many little cafes beside the wild river. You can walk over little bridges from one side to the other. For us just a cold Coke will refresh us , before we leave again for the ride. We will follow a small river where green grass grows beside it. Many birds and also sometimes the storks live here. The camp will be at the side of the lake Ouiouane. In the morning we will ride through a cedar forest with a few oak trees here and there. A narrow path will take us to the village of Zaouat Ifran. This village is a true masterpiece. A small waterfall falls from 50 meters high. The rocks here are covered with many interesting kinds of plants. In the caves behind the waterfall is where the Berber monkey lives. Picnic is beside the river. You can even jump in the cold river to get refreshed. After the picnic we will cross the mountains to arrive on a plane. On the side is a natural reserve and occasionally you might see behind the fence a deer. We will follow a small trail and arrive at a high plateau where we will camp at the border of lake Afnourir. This is another natural reserve where many kinds of birds and frogs are living beside this lonely lake. A big canter over the lonely plane brings us to the cedar woods. Slowly, we descend down to the next plane. Big sheep heards are eating here the short grass. The villages are getting bigger and bigger, an indication of a return to civilization. Picnic beside a river in the shade of big trees. In the afternoon -- endless gallops brings us to the country of mandar Ito, a last hard climbing up and we will find our cars. After saying goodbye to our horses, the car will take us back to the town of Fes, where we stay in the riad. Individual return from the riad. Horses: Arab, Berber -- stallions & mares. You will ride small but very surefooted arabian-berber horses. Mares and stallions go together on the ride. you should always be attentive when riding and take care of distance between the stallions. The stallions and mares go well together, but some of the stallions need extra space when two are in the same area. A whip is suggested for the stallions as they need strict orders. This doesn't make them difficult to ride, they just require more firm direction and more attention. These horses can get very attached to their riders and are always ready to please. Fes enjoys a warm Mediterranean climate. Spring is generally warm and sunny. Summers are hot and dry. However, there are sometimes thunderstorms and hard rain, but only for short periods of time. This time of the year is pleasant and a popular season to visit. Winters are usually is cool and can be quite wet with an average of 10 rainy days a month in Fes. You will spend 2 nights in a hotel and 7 nights camping. You will change champ sites 6 times. Riad El Yacout is an ancient private residence of a rich merchant in the beginning of the last century in Fès and is ideally situated in the heart of the medina. 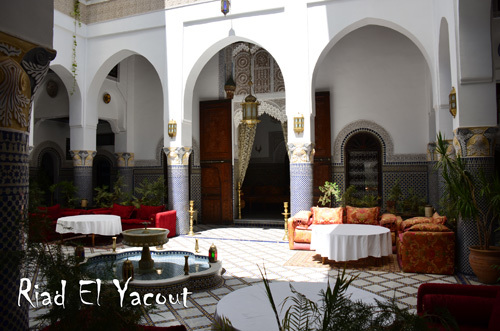 El Yacout was restored by Fassis expert craftsmen and now offers comfortable rooms with personalized decoration. All rooms are equipped with modern en suite facilities and WIFI internet access. Each room contains a satellite TV, telephone, safe, mini fridge, air conditioning, bathrobes, toiletries, and hairdryer. The hotel also contains a spa and swimming pool. Laundry can be arranged for an additional fee. *Please note that hotels are subject to change based on availability. Double check at the time of booking!